Posted in: Schizophrenia. Tagged: CAC-Hålet, CAC-Hålet Theory, Carbon Disulfide, CS2, Schizophrenia, Schizophrenic, The etiology of Schizophrenia, TRPV. PCP, LSD, Ketamine and …. have been used as models for the state of schizophrenia, the problem with that models is very simplified, that the person with schizophrenia usually don’t have them in their blood. 3/ There might be a connection with, the reactive phase of Schizophrenia etiology and the substance. 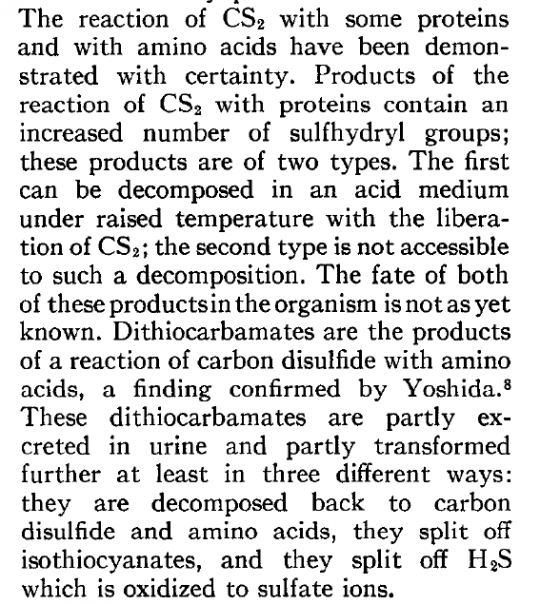 Since Carbon disulfide is a known neurotoxin one might think that we just have to remove the external source of CS2 exposure in order to eliminate the problem. But the source is not external it is internal. And this endogenous production of Carbon Disulfide is continuously taken it’s toll on the system. I conclude that Carbon Disulfide could be a reactive factor that trigger but don’t predispose for the etiology of Schizophrenia. A part of the CAC-hålet theory is now moving to GDNF – BDNF from The Etiology of Schizophrenia @ Co2reactivity.